Nike, Converse, and Jordan Brand’s illustrious Art Of A Champion collection has honored a number of the most legendary performances in NBA Playoffs history with both new and old iterations of iconic Nike Inc. silhouettes. To round out the collection, the Swoosh is taking its brand new fusion silhouette – the Air Force 270 – and creating a version inspired by the Larry O’Brien Trophy. Equipped with metallic gold details throughout its upper that are meant to emulate the 24k gold-plated trophy that each and every player aspires to obtain, this AF270 is decidedly regal. Set to conclude the confirmed Art of A Champion drops, one mystery release is still in the works, and will likely be announced following the conclusion of the NBA Finals. 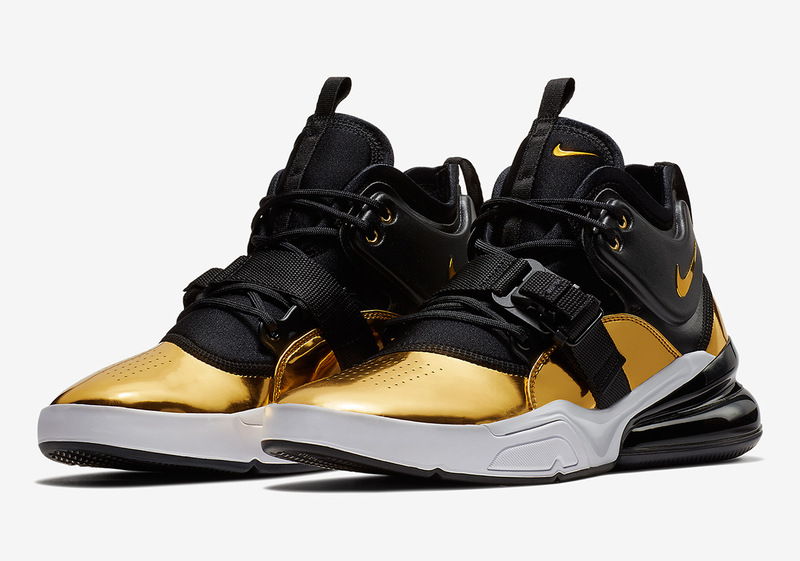 Enjoy an official set of Air Force 270 “Gold Standard” images below and mark your calendars for its June 16th release.